Imagine logging onto your bank account just by glancing at your phone. That's what some TSB customers will be able to do from September when the bank introduces iris recognition to its mobile banking app. It will be the first bank in Europe to introduce the technology, but its arrival will test customers' trust in biometric technology. Customers will need the latest Samsung Galaxy S8 to use the new way of accessing their TSB accounts. Once they have registered their irises, they will be able to log in by simply looking at the phone. TSB's chief information officer Carlos Abarca said iris recognition was the most secure form of biometric authentication currently available. "It takes advantage of 266 different characteristics, compared with 40 for fingerprints." He said it offered customers a combination of security and convenience: "It's extremely fast - it takes less than a second to get in - and the gesture is very natural. And you don't have to remember secret numbers or passwords." Samsung added iris scanning to the biometric security options, alongside face recognition and fingerprint scanning, when the phone went on sale earlier this year. 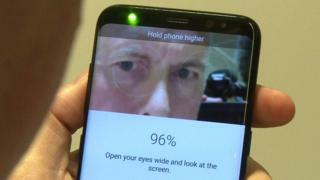 In May the German hacking group the Chaos Computer Club said it had fooled Samsung's iris scanner with a photo used to make a dummy eye. Samsung insisted that it would take an extraordinary set of circumstances, where someone had access to both the phone and a high definition photo of its owner's eye, to beat its system. TSB's Carlos Abarca said he was confident in the security of iris scanning: "There's no security option that is absolutely perfect. We're relying not only on the biometrics but the digital certificate on the phone. To fake your eyeball is potentially possible - but it is extremely difficult." Biometrics has been touted as the solution to establishing someone's identity for the last twenty years but has made slow progress. You can see facial recognition and iris scanning in use at automated passport control systems in various parts of the world, but it's the widespread adoption of smartphones which promises to supercharge adoption of the technology. The fingerprint scanning which arrived on Apple's iPhone in 2013 and is now a feature of many Android smartphones allows millions of users to pay for anything from a cup of coffee to a train journey by touching their phone. Isabelle Moeller of the Biometrics Institute has been working to promote adoption of the technology since 2001. She says consumers have two major concerns: "Privacy and safety - they want to know their data is secure and the system can't be spoofed." But she says the industry is establishing benchmarks for best practice: "If we can get that right the convenience that biometrics offers can create a fantastic customer experience." TSB customers can already log on to their mobile banking app using fingerprint recognition. The minority with a high-end Samsung may try out iris scanning when it becomes an option in September. But in the biometric battle the simplicity of just putting a finger on your phone may prove more attractive than holding it up and looking at it.